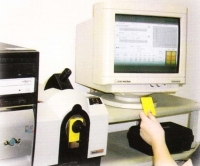 Spectrophotometer readings on Data Color Chroma Calc® system. This newest system is capable of providing color matches within minutes, provide automated corrections to the original standard and retain a history of production orders to ensure quality consistency from lot to lot. All orders are accompanied with spectrophotometer printout, quality control chips and Certificate of Analysis. If we separate light into its different wavelengths, we create a spectrum. We can then create the different colors by mixing the separated wavelengths of light in varying intensities. Spectrophotometers measure light reflected from an object at each wavelength. This spectral data can be displayed numerically, or in graph form. Spectrophotometers are ideal for measuring metamerism, the phenomenon in which two colors look the same under one light source, but different in another. How Do We Make Color? Our laboratories custom match colorant systems and additive compositions designed specifically for your application.